Oh have I got a fun video clip to share with you. Have you ever wondered what goes on behind the scenes when making a DVD? Here is your chance to find out! Whenever I film a DVD I am busy at work doing my part as the host or animal trainer. I do a little bit of work explaining my vision and shots I think would support it. But most of the real work is in the hands of the film crew that you usually don’t get to see. Einstein the African Grey Parrot, who appeared in my recent DVD Train Your Parrot to Talk, has caregivers who find film and photography as interesting as I do. Jeff and Marcia were gracious enough to allow me to interview them for the DVD, and they also set up their own cameras to capture this glimpse into the making of a parrot training video. An interview with Jeff and Marcia is featured in the DVD. And of course Einstein also makes an appearance. She also lends her voice to the CD ROM of talking parrot recordings you can play for your own parrot. You can find out more information at Train Your Parrot to Talk. It has been a busy month releasing the new DVD Train Your Parrot to Talk, putting out another issue of Good Bird Magazine, presenting at Parrot Festival and somewhere in all that I came down with a nasty virus! However even though I have been rather busy, every day there has been time made for Blu Lu training. Yay! I just have not had time to blog about it until today. Blu Lu the Blue Throated Macaw from the Bird Endowment is doing extremely well. One of the behaviors she has really been practicing is her flight training. You may recall I posted a video a while back about training her to fly to different perches in my house. I wanted to share a video clip of her progress since then. She is really mastering her flight skills. She has learned a nice quick response to my cue for recall. She is sometimes a little slower than I would like flying to a perch when I cue her. But I suspect that part of the problem is that being with people is also a strong reinforcer for her. So going away from a person is tougher than coming to one. One of the benefits to training your bird to fly to designated perches in your house is that it makes it very reinforcing for your parrot to fly to those spots. So instead of chewing up the back of a chair, or flinging papers off of the table your parrot deliberately opts to go to the perches. I do have another place in the kitchen loaded with toys that Blu Lu goes to as well. These also work as reinforcers for her to stay in that area and have fun. This really handy strategy of making the behavior you want your parrot to do the most reinforcing option is based on The Matching Law. You can apply this to so many aspects of living with a parrot. Think of it this way. If your parrot has the choice to do behavior A or behavior B, whichever one he knows will earn the most reinforcers is the one he will do. This means it is your job to make the behavior you want your parrot do more fun than the one you don’t want. For example make it more fun to play on play stand, than chew up the books on the book shelf. The video clip does not show off her maneuvering skills. She literally can fly through every doorway and turn every corner in my house, which can be quite tight at times. She is a smaller species of macaw, but even so, it is quite impressive. She also does this with impeccable precision. You can literally “see” her making decisions on the wing as she decides where she will turn and where she land. I never get tired of watching a young bird master flight skills. More videos to come as her training progresses………. The latest issue of Good Bird Magazine is here. Training Your Parrot to Interact with Toys - Includes Video Tutorial! 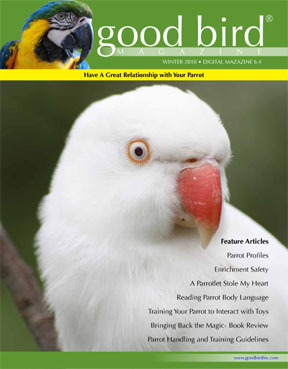 Click on the link to see a free sample of Good Bird Magazine with all the features. Your subscription also includes a PDF version that can be downloaded to Smart Phones and E-Readers. Try the free app iBooks for iPhones and iPads. Have you ever wondered how to get a parrot to talk? They say all parrots can mimic sounds, but we all know not every parrot is a talker. The good news is there are some techniques you can utilize to increase the odds of creating a great talking parrot. I have had the good fortune to work with a number of amazing talking parrots over the years. But of course my personal favorite is my own Yellow Naped Amazon parrot, Delbert. I applied all the techniques I have learned over the years as a professional animal trainer to train Delbert to talk and sing. And I am pleased to report the results have been beyond my expectations. In this DVD I address common myths about talking parrots, which birds make ideal candidates for talking, the most effective ways to expose your parrot to sounds you want repeated, proven methods for encouraging your parrot to vocalize and most importantly how to train your parrot to talk on cue. Also included is an appearance by Einstein, the Talking Texan Parrot, plus an interview with her human companions. The bonus CD ROM includes recordings of a variety of species of parrots vocalizing to inspire your bird to talk. The recordings feature participants in our Best Talking Parrot contest and also my Amazon parrot Delbert, plus Einstein! You can play just the species most closely related to your bird or you can play the mp3 of the entire collection of vocalizations if you live in a mixed species household. In the DVD I explain how I use this tool to train Delbert to pick up new things. I have a special set up that makes it super easy. Besides being a great training resource I find the recordings are a wonderful form of enrichment for my birds. It makes me feel good to see and hear my parrots having such a great time listening to the mp3's. I was at a conference recently and when I mentioned how much I enjoyed having parrots in my life, everyone in the room seemed to know just what I meant. I also received many emails from people who told me how much they enjoyed watching the videos of people interacting with their birds in The Best Talking Parrot contest. It was that special connection that was having such an impact. You can order your copy of “Train Your Parrot to Talk” by visiting the Good Bird Inc website.